The Lavalier Clip-on from Savage is an omnidirectional condenser microphone with low handling noise for capturing audio with DSLRs, smartphones, camcorders, audio recorders, PCs and more. The lavalier clip-on is powered by a single LR44 battery and terminates in a TRS 1/8" (3.5mm) mini jack connector. It includes a lapel clip, LR44 battery, windscreen and 1/4" (6.3mm) adapter. 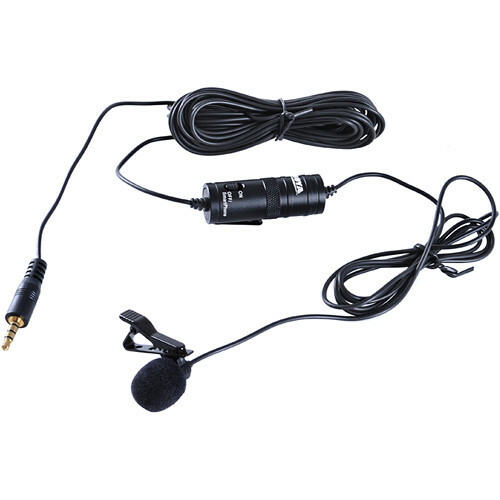 Box Dimensions (LxWxH) 15.9 x 6.05 x 1.35"
Lavalier Clip-On Omnidirectional Microphone is rated 3.0 out of 5 by 2. Rated 1 out of 5 by Heavy Haul TV from Waste of money I hooked it up to my Panasonic HC-V750 camcorder. The sound recorded on the street with this mike was much worse than what I got from the cam's built-in mike! Rated 5 out of 5 by Jeff the video guy from I would buy this product again. Thanks for making an affordable but excellent product. How does this compare to the Rode SmartLav? Although this microphone is fine for general use and offers a low-cost solution, the RODE Smart Lav is the superior device. Compatible with Canon Rebel XTi/DSLR's? Unfortunately not. The Canon Rebel XTi does not have an input for a microphone. Hence, a microphone such as the Savage MIC-CELL will not work.